With the widest selection of full-blooming varieties, Optimara continues to advance the industry with new plant varieties and innovative growing techniques, constantly refined over years of research and development. We create new, exciting plants and care products which are trend-setting and truly functional. Our effort is to continue offering customers a unique selection of flowers in a beautiful product line. Our company was founded in 1904, by Martin Dorrenbach in Isselburg, in the lower Rhein Valley of Germany. By the 1930's, the son-in-law and horticulturist, Hermann Holtkamp, Sr. bred his first Saintpaulias on only one square meter (10.76 square feet) of greenhouse space. At the time, Mr. Holtkamp said that the African Violet would be the potted plant of the future. Our company grew many different crops, later to be replaced, one by one, by the African Violet. At Optimara we know that our responsibility for our products does not stop after the sale. 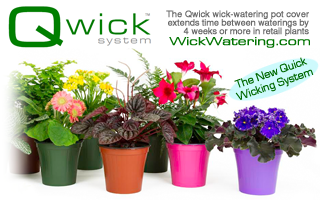 Our extensive online resources provide consumers with valuable plant care information. From the most popular African Violet in the world to a complete line of consumer plant care products, Optimara has what it takes to make your business grow. •Fresh Violet Alerts, •Retail Store Locator(USA), •All Optimara Variety Names in Searchable Database, •Free Guide to African Violet Types (PDF), •Easy-Care Tips, •Blooming Tips and Artificial Light, •User Photo Gallery(submit your optimara potos) •Information on Future Varieties. African Violet Easy-Care Tips •Violet of the Month Club, •150 Violets by Leaf, •2" Mini-Violets, •Quarterly Specials with Vintage, Rare or New Varieties as 4" plants, •Space Violets available by Leaf or Plug, •Optimara Soil and Fertilizer, •Ceramics & Containers, •Ferns, Foliage, Episcia, Kalanchoe, Fittonia, etc. 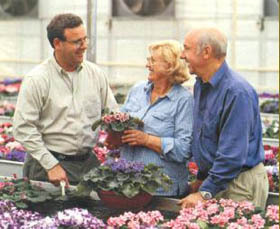 Reinhold Holtkamp, Sr., (right) served as President with his wife Gisela Holtkamp, and his son, Reinhold, Jr., (left) as Vice President of Optimara/Holtkamp Greenhouses. One of the most exciting breakthroughs in the research and development of the African Violet was in the early 1960's, with the introduction of the first non-dropping variety called Elfriede. Today all of Optimara Varieties and most all other competitive varieties available on the market have this essential genetic characteristic. In 1961, the name of the company changed from Dorrenbach-Holtkamp Greenhouses to Hermann Holtkamp, KG. In 1977, Holtkamp Greenhouses was founded in Nashville, Tennessee, and the Optimara brand name was introduced to the American consumer. In 1981, we started with Optiflora, a plant care product line which also sells its products under the Optimara brand name. In 1992, the company in the USA began growing miniature Poinsettias. Over the past few years, the company has added Elatior Begonias, Rex Begonias, many varieties of ferns and foliage plants to its product line. In the future, we hope to add even more items which will give the company new and exciting opportunities in delivering a diverse product line to the consumer into the 21st century. Copyright 1999-2017 Optimara/Holtkamp Greenhouses, Inc. Nashville, Tennessee. Doctor Optimara, the Doctor Optimara logo and Optimara Field Guide are trademarks of Holtkamp Greenhouses, Inc.
Optimara, the Optimara logo, EverFloris, MiniWell, MaxiWell, WaterShip and Watermaid are trademarks of International Plant Breeding, A.G., Switzerland.